Overview - The Select Disposable Absorbent Underwear is for heavy protection. The soft, breathable cloth-like outer fabric has a full rise waist panel which provides a more comfortable fit. They are easy to pull up and down just like normal underwear. Select is Tranquility's economy version. The compact absorbent core is shaped for a better fit and better absorbency. The words “Front” and “Back” are imprinted along with size identification. They have tear away side seams to allow for easy removal of this pull up. Absorption – The Select Disposable Underwear is rated for heavy incontinence. Holding 14.5-19 fl oz, realize that the average adult bladder holds 16 fluid ounces. See our comparison chart. These are designed for urinary incontinence only. Odor Reduction – The absorbent core quickly wicks any fluid into the center core and retains it there. The urine is not exposed to the air long enough for odor to develop. If you're having trouble with odor during an adult diaper change, use an odor eliminator. Additional Products – Some feel more confident with a cover up. They like the idea of added extra protection. For overnight use, or to add extra capacity to the product, you may add booster pads. Suggestions Alternatives - This product is not rated for bowel incontinence. 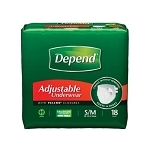 A bowel incontinence product similar would be the Tena Discreet Protective Underwear (pull on). 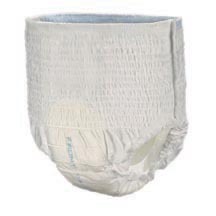 If you wish a diaper with tabs style product; a comparable product would be the Select Disposable Briefs. They are the same type of product only with the tabs instead of being the pull on style. How good is this diaper for absorbency? This product absorbs close to a full adult sized bladder loss and is rated for heavy incontinence. Some people with full incontinence will find that it absorbs enough and some people will have to add a booster pad or use something like the Tranquility Premium Overnight Disposable Pull-ons. Why would I use a diaper with tabs versus a pull on style? The pull on style is great. It is so similar to normal underwear. However, just like normal underwear, in order to change to a clean product, you will need to remove your clothing from the waist down. With the diaper with tabs, you can simply slip it between your legs and fasten. This diaper is not working for my night time use, what can I do? Many people use a different product for overnight use. These products are designed with a higher capacity. Because your body muscles relax at night, you have a tendency to have a heavier flow and need a higher capacity product. Or you can add a booster pad to this product. The booster pads can add anywhere from 8-16 ounces to the capacity of your current product. I have a larger waist than most people, is there a larger product than the Selects? Yes, there is product available to fit up to 106” waist - the Tranquility Air-Plus Bariatric Brief (Overnight). First you need to measure your waist at the belly button. This will give you your actually waist size. Some people try to use their pants size which does not work unless your pants sit at your waist. In our Plus Size section there are a lot of choices available. There is also a pull up style that goes up to an 80 inch waist - The Tranquility Premium Overnight Pull Ons. 5. I need help and I am kinda embarrassed to talk about it, how can I contact you? There is a section to contact us via email. We usually respond within 24 hours. Or you can call in 866-559-0353. We have years of experience and are happy to help you. We will try to assist you in finding the right product for your needs. About Select– The Select brand is manufactured by Principle Business Enterprises as an economical answer to the incontinence needs of many who are on a very tight budget. They have managed to product a good quality product at a reasonable price. The Select brand, while not as absorbent as PBE’s Tranquility, is more absorbent than most brands on the market today.